If the Chang'e 3 moon rover mission is successful, it will mark the first time China lands a spacecraft on another celestial body. The lunar probe has completed its research and manufacture period and has officially entered the launch phase, according to China's Xinhua news agency. The carrier rocket for Chang'e 3 has gone through its first test, and the launch pad and control systems are ready for the mission, the state news agency reported. Chang'e 2 spacecraft's orthographic projection diagram of the full moon. The Chang'e 3 spacecraft will launch from Xichang Satellite Launch Center in southwest China. After it reaches orbit around the moon, its lander will fly down to the moon's surface — to a targeted landing site or Sinus Iridium, or the Bay of Rainbows. Then, the lander will deploy a rover to explore the lunar landscape. A Chang'e 4 spacecraft, which also includes a lander and rover, has also been built to serve as a backup, according to past reports. To prepare for the Chang'e 3 moon landing, China conducted an extensive reconnaissance campaign of the Bay of Rainbows using the Chang'e 2 spacecraft. China's space agency has taken a stepping-stone approach to lunar exploration. 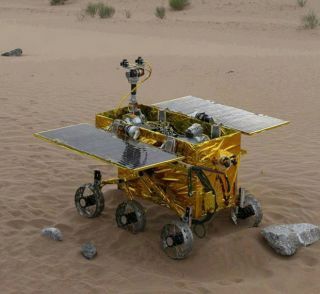 The program began with the Chang'e 1 and 2 orbiters, with the Chang'e 3 rover marking the next step in the project. After the lunar rover mission, the next goal in China's moon program will be to launch a probe that can return samples from the moon to Earth. That moon sample-return mission is expected to fly before 2020 under the name Chang'e 5, officials with China's space agency have said.